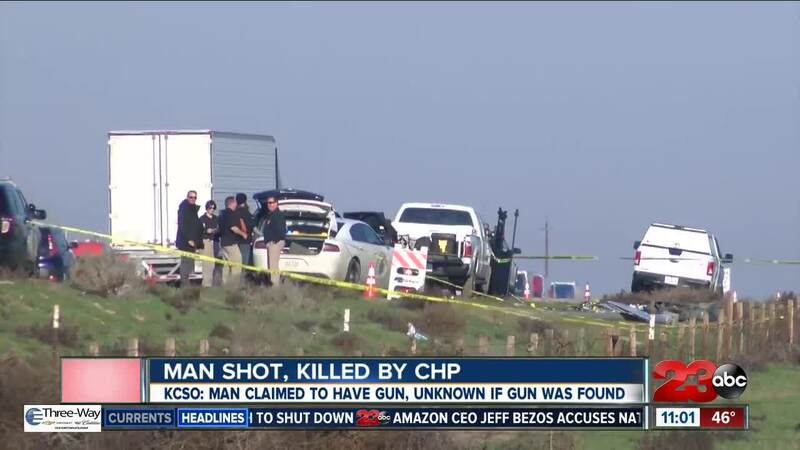 One person was killed during a CHP officer-involved shooting on northbound I-5 near Highway 43 early Friday morning. According to KCSO, who investigated the incident, CHP responded to reports of a crash shortly before 5 a.m. on northbound I-5 just north of Highway 43. When the two CHP officers arrived, they found the vehicle and an adult male. Officials said that the vehicle was along the righthand shoulder of northbound Interstate 5 and it had collided with a light pole, traveling through the east fence line and coming to rest in a field northeast of Interstate 5 and Highway 43. KCSO says the man told officers he had a firearm. According to KCSO, the man kept approaching officers and not complying with orders when the officer-involved shooting occurred. Medical aide was provided, however the man died at the scene. No officers were injured during the shooting. The man's identity is pending notification of next of kin. Kern County Sheriff’s Office is leading the investigation in partnership with the CHP and the Kern County District Attorney’s office. KCSO is still in the early stages of the investigation, and will give more detailed information when the investigation is complete. Anyone with information is urged to call The Kern County Sheriff’s Office Communications Center at 661-861-3110.